And now LARRY DOBY, the story of first African-American to play major league baseball after Jackie Robinson broke the color barrier. Unfortunately and unsurprisingly, the barrier didn't go away the moment it was broken, but each player who followed after Robinson and Doby made way for more players of color to follow, as those who play now make way for those to come. Cannaday Chapman will illustrate for a spring 2021 release with Clarion, and Jennifer Greene will edit. Krista Vitola at Simon & Schuster Books for Young Readers has acquired THE DIRT DIARY author Anna Staniszewski's stand-alone middle-grade novel, THE WONDER OF WILDFLOWERS, about ten-year-old Mira, a Polish immigrant who lives in an alternate America where magical Amber is a natural resource that not everyone is permitted to use, as she struggles to fit in and find her place against all odds. Ammi-Joan Paquette did the deal for World English rights, and the book will be published in spring 2020. It's sadly true that you will need to wait a couple of years to embark on this journey. But luckily, there are many delicious Anna treats to dip into in the meanwhile, including her bestselling DIRT DIARY series, or the smashing picture book, DOGOSAURUS REX. Not to be missed! Congratulations on your newest deal, Anna! e.E. Charlton-Trujillo's Stonewall Award-winning FAT ANGIE portrayed a high-schooler at her lowest, as she began to pull herself into some semblance of a life she owns. Her popular sister was missing in Iraq. Her family was in a shambles. Angie found little to like about herself—until K.C. Romance swept into her life and swept Angie off her feet, helping her to begin to see herself as someone who can be loved. In the spring of next year, FAT ANGIE: REBEL GIRL REVOLUTION hits shelves, and readers will find Angie having a Breakfast Club on Wheels adventure, complete with a new romance, an unexpected group of friends, and growing confidence for Angie. And now, I am so happy to announce that FAT ANGIE: HOMECOMING has a triumphant Angie back at school, stumbling into internet fame, starting a band, juggling TWO love interests, and working through old family wounds. I cannot WAIT to see Angie tapping into the inner power she's been looking for all along! Joan Powers of Candlewick acquired this one, as she did the others, and will shepherd it to bookshelves for spring 2020. Congratulations, e.! Did you know that in the first month of a wolf pup's life, it changes a LOT? In the time it takes the moon to go through one cycle, the eyes of a newborn wolf open, its ears raise, and it begins making noises like growls and first attempts at howling. hackles rise upon their backs. what's hiding in the dark? then another, then a bark! We are thrilled that Stephanie Pitts of Putnam fell in love with this text, and then signed the incredible Jonathan Bean to do the art. What a pairing! This will hit shelves in fall 2020, and I can't wait! Bonjour! Do you know the most beautiful animal, Escargot, the French snail? If you do not, you should, mon ami! So many readers have come to love Escargot that his first book, which came out last year, is now in its 7th printing! C'est magnifique, oui? 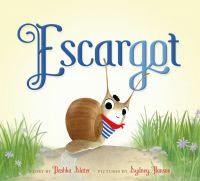 It is no surprise, then, that Escargot's creator, Dashka Slater, is going to bring a new Escargot story to readers, along with illustrator Sydney Hanson and Farrar, Straus, & Giroux's Joy Peskin. This time, Escargot will look for himself in the library! You can look for him, too, starting in spring 2020. There’s More MG Coming from J. Anderson Coats! You fell in love with J. Anderson Coats's writing voice in THE WICKED AND THE JUST. You became instant best friends with Jane and her friends in THE MANY REFLECTIONS OF MISS DEMING. And her most recent R IS FOR REBEL had you kicking over all stops to stand up for what's right. Friends, you need wonder no more. There is a new J. Anderson Coats book on the way, and it is going to be epic. Inspired by true twelfth-century accounts, this exciting new historical fantasy tells the story of a girl who comes upon two mysterious, green-skinned children, only to learn their terrible secret and become caught up in their dark past. This deal has been in the works for a while, so you will only have to wait till next year to get your hands on this baby: stay tuned for Fall 2019! Did you know our dear Paula Yoo used to work as a reporter for several papers, including The Detroit News, where she worked just a little over a decade after Vincent Chin's death? His death and the events that came after sent shockwaves throughout our country, galvanized the Asian-American community, and heavily influenced Paula. It seems very appropriate that she is writing a book to tell us the story. We remember Vincent's death, but do we remember Vincent and the brave people who fought so hard for justice on his behalf? I'm so honored to be a part of this book and so proud of Paula, I can't even tell you. This will be a book to anticipate in 2020. Simon Boughton, in his first purchase at Norton Young Readers, has bought Paula Yoo's debut YA nonfiction book about Vincent Chin, a Chinese American whose beating death at the hands of two white autoworkers in Detroit in 1982 galvanized the Asian-American civil rights movement and led to stronger federal hate crime legislation. The book is slated for publication in 2020; Tricia Lawrence at Erin Murphy Literary brokered the deal for North American rights. Have you read Corinne Duyvis's ON THE EDGE OF GONE? If you haven't, you are really missing out! This incredible award-winning near-sf novel is a stand-out read that mustn't be missed. Maggie Lehrman at Amulet has acquired On the Edge of Gone author Corinne Duyvis's next YA novel, The Art of Saving the World, a speculative tour-de-force about a girl who has grown up near the site of an interdimensional rift. On her sixteenth birthday, things get a lot more complicated when a multitude of strange things—and people—start coming through the rift, threatening everything and everyone around. Ammi-Joan Paquette at Erin Murphy Literary Agency did the deal for World English rights. Publication is planned for summer 2019. Seriously, though! This is an author to watch, so mark your reading calendars accordingly. And biggest congrats to Corinne!! Once upon a time, Elizabeth C. Bunce was the very first Morris Award winner (for debut YA fiction, from YALSA) for A CURSE DARK AS GOLD, an auspicious debut, indeed! That was followed by two well-reviewed YA fantasies and then a long break. And now she has surfaced anew, facing a slightly different direction—her next book will be a middle-grade cozy mystery! With three sequels! I couldn't be happier that Elise Howard at Algonquin connected so strongly with PREMEDITATED MYRTLE, a fantastically well plotted mystery set in Victorian England and featuring a protagonist that Elise kept comparing to Flavia de Luce. In fact, she connected so well with her, and with her creator, that she made a four-book offer, taking it off the auction table before the auction got going! MYRTLE will launch in spring 2020, with sequels to follow annually, and I. Can. Not. Wait! We're so happy to be celebrating the release of four new EMLA books today! 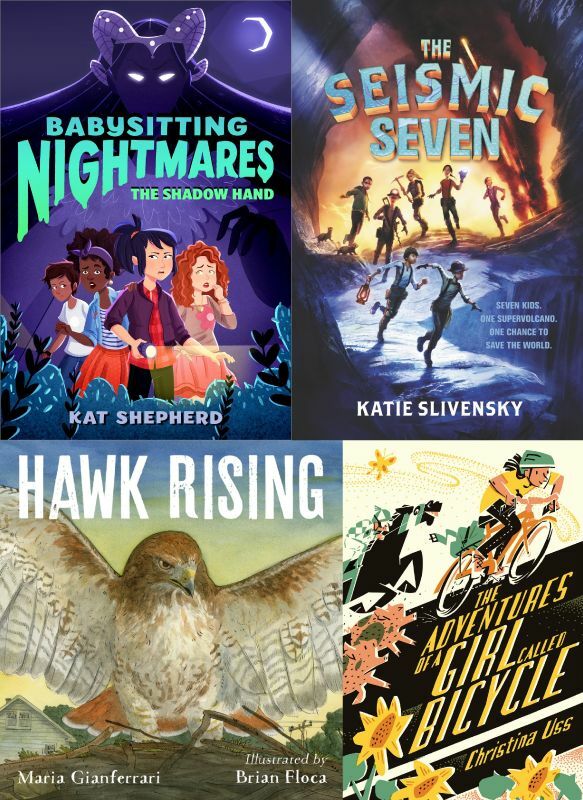 Huge congratulations to Maria Gianferrari (HAWK RISING), Katrina Knudson (THE SHADOW HAND), Katie Slivensky (THE SEISMIC SEVEN), and Christina Uss (ADVENTURES OF A GIRL CALLED BICYCLE)! There’s More STU TRULY On the Way! Dan Richards has made his name thus far with his own brand of quirky, laugh-out-loud picture books. But this brand is poised to widen right out with the publication of his first novel, STU TRULY—coming in July to bookshelves everywhere! Dan Richards's STU TRULY'S FIRST KISS, following the further adventures of the well-meaning Stu as he muddles his way awkwardly toward his first kiss, whether he wants to or not, to Sonali Fry at Yellow Jacket, for publication in summer 2019, by Ammi-Joan Paquette at Erin Murphy Literary Agency. Mark your summer reading calendars, folks! You're going to enjoy having Stu on your friends list. Huge congrats, Dan!